Of all the signs and portents that we are drawing near to the end of human civilisation (floods! earthquakes! economic strife! global unrest!) none has scared me more than this: at last, DreamWorks Animation has made a great animated film; a Pixar-quality film, if I dare say it, despite fear of my blasphemy bringing down the fist of an angry god. I wonder how much of a coincidence it is that How to Train Your Dragon, this miraculous picture, was directed by Disney veterans. Or rather, one Disney veteran, and one guy who has floated around here and there but clocked some time at Disney over the course of the years. Chris Sanders and Dean DeBlois are best-known, certainly, for 2002's Lilo & Stitch, the best Disney animated feature of its decade, not least because it is the most cheekily unconventional (and whose worrying lack of comfortably "Disneyesque" notes led to executives who didn't quite know what to do with it). The look and some of the tone of that film is omnipresent in How to Train Your Dragon, which is also not a coincidence: DreamWorks has perhaps now discovered what Pixar has always known, which is that they key to great movies is giving great directors a free hand. Make no mistake, How to Train Your Dragon isn't as good as Lilo & Stitch: but if that's a sin, then there must be a lot of filmmakers in Hell. Set in a hazy time period when Vikings roamed the northern seas (and spoke in Scots accents), the film is the story of Hiccup (voiced by Jay Baruchel, unexpectedly great), a reedy weakling kid on an isolated island where the main occupation appears to be fighting the armies of dragons that come by at regular intervals to steal the villagers' sheep (oddly, sheepherding does not appear to be much of an occupation on the island, nor any other domestic activity, which wouldn't be weird if Hiccup didn't bring our attention to it). Hiccup's dad is the great Viking chief Stoick (Gerard Butler), and like all reedy children of heroic fathers in kids' movies, the boy is a well-intentioned fuckup whose chief claim to fame among his peers is that he has an amazing knack for getting in the way. That changes on the night of a certain dragon battle, when Hiccup's widely-ridiculed mechanical weapon (another mark of the well-intentioned fuckup!) manages to take down the most infamous, deadly of all dragons, a Night Fury. The next day, he journeys to the deep forest where the dragon went down, and becomes the first Viking to ever see this elusive beast, a sleek black worm with bright green eyes. Those eyes are exactly what keeps him from becoming the first Viking to ever kill this elusive beast, for no sooner does the dragon look into his face than Hiccup realises that he can't possibly take its life. Instead, he adopts the lame creature, rigging a device that will allow it to fly as long as he's on its back. In no time at all, Hiccup and the dragon - he names it Toothless - have formed a bond that doesn't sit well with Hiccup's enrollment at the island's dragon-slaying school, nor with his father's attempts to destroy the dragons' nest and rid the island of the creatures forever. Amazing that it takes that many words to synopsise an unmistakably familiar story. At any rate, familiarity is not a problem for How to Train Your Dragon, which effectively proves that any narrative scenario, however musty, can serve as well as the most twisty, clever plot. Besides directing, Sanders and DeBlois co-wrote the screenplay, based on Cressida Cowell's 2003 children's novel - loosely, I am told, and apparently they heavily altered the original draft, which was much sweeter and more kiddie-film friendly than what ended up onscreen (the writer of that draft is credited onscreen, but I haven't been able to find his name anywhere on the internet - looking at the online version of the poster closely and squinting, I think it might be "Will Daves") - and the two men (Sanders and DeBlois, I know my parenthetical got a bit out of control back there) do an excellent job, in the main, of telling this fairly routine story with gusto and heart. 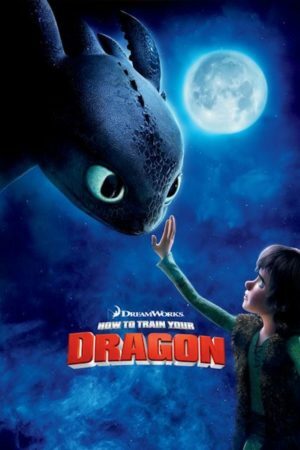 It does not perhaps boast the most iconic or wonderful characters you've ever seen, but How to Train Your Dragon certainly has a pleasant human core that is to be fott0126029und nowhere within shouting distance of the Shrek films, to say nothing of the even worse flotsam that makes up most of DreamWorks's output. Largely, this is because the filmmakers are committed to making something desperately unfashionable: an unironic old-style fantasy film for children, with nary a single pop culture reference in sight, and no more anachronisms that can be found in the modernist tang of the dialogue and the performances. Unlike most contemporary American children's cinema, which so eagerly assumes for the most part that kids are deadened automatons who'll respond to bright colors, fart jokes, and pop music, this movie prefers to treat its audience - and it does not differentiate between the part of the audience that is young and the part that is adult, to which I say "thank you" - as thinking people who like a good yarn. Not to mention that the historical context - however massively fictionalised - gives it a real-world heft conspicuously absent from e.g. Shrek's blandly invented Far Far Away. They also understand the appeal of a proper epic fantasy, and while at 98 minutes long, How to Train Your Dragon isn't really "epic", there's a wideness to the universe it creates that makes it feel richer than so many animated adventures; it also has an eager "gee-whiz!" quality to some of the splashiest moments that gives it a real sense of fun, something else that doesn't exist in terribly great supply in modern cinema, for children or otherwise. 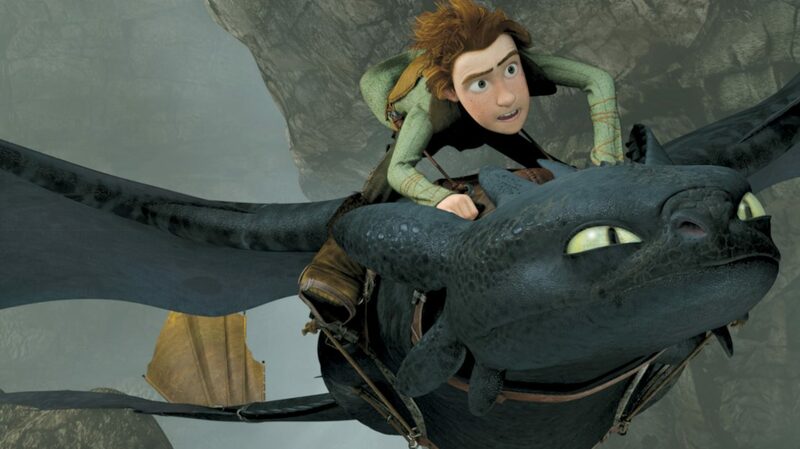 The scenes of Hiccup riding on Toothless are an exercise in plain delight, a breathtaking cinematic depiction of flight that recalls Miyazaki. It's a joy to behold, a freewheeling exploration of impossible vistas that recalls, and arguably betters, the similar moments in Avatar. Nor does the film only offer splendors in this sense: it's also gorgeous (Roger Deakins consulted on the artificial cinematography, just as he did with WALL·E). The character animation is so much better than anything else to come out of DreamWorks animation that I half refuse to believe that it could be the same people; Hiccup especially combines a very rounded, carictatured features with such carefully designed texture and physicality that it should be shriekingly uncanny. But it isn't. The characters in the film look absolutely amazing, realistic cartoons like you couldn't see in real life, but somehow you have the sense that it is real life. As far as design goes, though, the dragons win out over the humans. There's a remarkable menagerie of varied sizes, forms and colors (I'm reminded of the dozens of alien species displayed in Lilo & Stitch), and honestly this, more than anything else about the film, is what proves that the filmmakers had a sincere desire to flesh out this world, and explore it. Naturally enough, the most appealing of all the dragons is Toothless: so obviously modeled after Stitch (one of the damn cutest of all Disney characters) that I don't feel obliged to comment on it, the dragon's movements are exactly those of a house cat, which for a cat person like me is just the icing on the cake: Toothless is already a painfully charming figure just in his eyes and mouth, but seeing him roll around and curl up like an overgrown pet melted me altogether. Your mileage, as it is said, may vary. The film is sweet; it is sincere; it is pretty; it is fun; it is vast in scope. I can't think of anything missing. Admittedly, the familiarity of the story does work against it a bit, as does the fairly disposable personalities of Hiccup's fellow teens (voiced by an assortment including America Ferrera, Jonah Hill and Christopher Mintz-Plaase; a sop to hipness that is the only evident sign that we're still in DreamWorks country). But these are relative minor issues compared with the charms on display everywhere else. Hiccup may not be the most well-written hero in animation history, and his story is pre-ordained from the first frame; but that does not make him less likable, and it certainly doesn't make his friendship with the aggressively darling dragon any less touching. Familar stories work; that is how they come to be familiar.